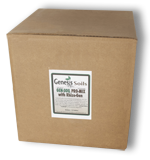 Genesis Soils announces the addition of Gen Soil Pro Mix in a smaller format volume specifically for today’s home gardener. 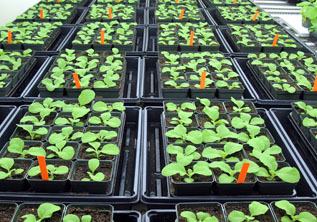 We offer this propagation mix with a 40 cell planting tray. This will allow the consumer to select their favorite seeds or cuttings and plant them in Genesis Soils Pro Mix. Once the seeds germinate in our soil and come in contact with Genesis Soils Rhizo-Gen Mycorrhizal components in the soil mix, the plants are now inoculated with the same protection that has been given to plant life for 460 million years. Our proprietary blend of soil components is where Genesis Soils differentiates itself from any competition. We know from 40 years of experience what enables true mycorrhizal colonization of the highest level. Your plants when ready to transplant from the starter trays can be planted in healthy soils and will have the protection from first root elongation for the life cycle of the plant you are growing. Aiding in extreme nutrient uptake, water efficiencies, natural disease protection and most importantly flavors that only true organically based soils can provide. Plants without the benefit of Genesis Soils will only fall short of what Mother Nature has been providing for 460 million years. We know how to duplicate natural soils for the benefit of the consumers whose philosophies are parallel with ours. 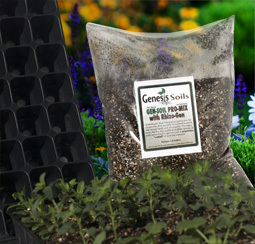 Natural, sustainable soils with the benefit of mycorrhizae and beneficial bacteria combined with a proprietary blend of composted elements are what Genesis offers to its customers through experience. Soils with various animal manures that are high in sodium and ammonia, bat guano, synthetic based fertilizers such as a 20-20-20 are not what Mother Nature intended for us. Think about you soils as the umbilical cord to your existence. 1. Fill the tray with Pro Mix, gently packing soil until tray is full. 2.Water the soil to capacity prior to seeding or planting cuttings. 3. Seed or plant your cuttings and water in gently. 4. Keep soil temperatures between 70 and 75 degrees. This method will help you know when to water. Simply water the plants keeping the soil within this temperature range to reduce the possibilities of damping off. 5. Genesis Soils Pro Mix has natural nutritional values in the mix. If you want to boost the performance of the plant, simply use low dosages of organically based fertilizers low in N & P.
6. Once the plants are at the 50% growth level you expect you may now increase temperatures and nutrient levels. 7. Once the roots occupy 75% of the soil volume, you are ready to transplant, providing all the soil stays intact in a root ball when extracted from the cell tray. 8. Your plants are now ready to be transplanted into soils that are organically based such as ours. 9. Continue with organically based nutrients through the entire lifetime of your plants. At Genesis Soils, we do not recommend bat guano, chicken or other animal excretions. We do not recommend synthetic fertilizers such as 20-20-20, if it burns your hands, think what it will do to you.